Beautiful dark maroon Motorola in a Polystyrene case. The color is even throughout the case. Many of these dark maroon cases have ultraviolet streaks in the case, but not this one. The front has an unusual geometric gray grille. It has its original back. A few marks and minor scratches from 60+ years of service, but no cracks, hairline cracks or chips. The radio has been checked by a professional, and everything that needed changing was replaced. The radio is a six-tuber and has great reception, playing very well, picking up all my local AM stations and distant stations at night. A nice lit up dial. 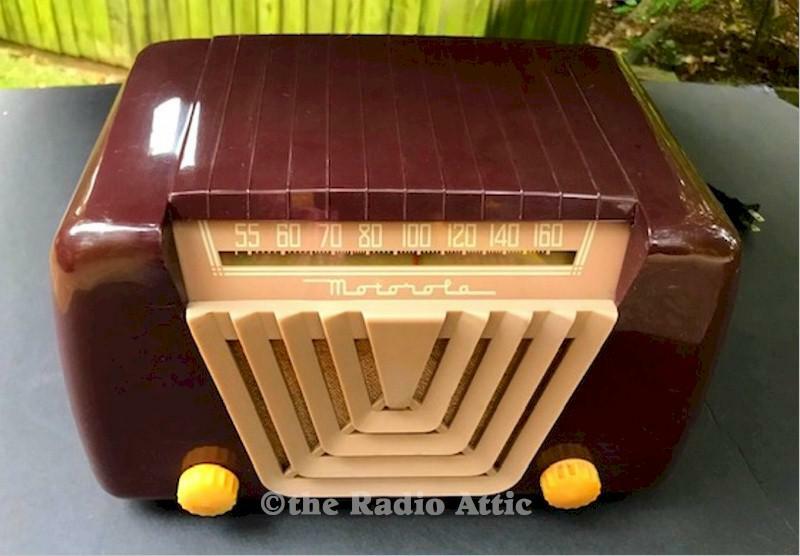 This is a classic 1950's Retro radio. About 11-1/2"W x 8"H x 7"D.
You are visitor number 442 to this page.